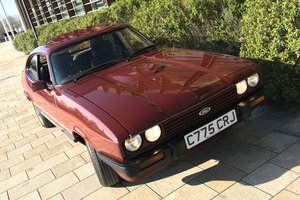 The last of a famous line, a Ford Capri 280 Brooklands build 971 with 6,212 miles. Body-coloured grille, lamp bezels and door mirrors, bodyside mouldings, power assisted steering, front and rear spoilers, tailgate wash/wipe, tinted glass all round, tilting/sliding steel sunroof, ammeter and oil pressure gauge, tachometer, quartz analogue clock, Ford ESRT 32PS electronic radio cassette, electric aerial, courtesy lights, perforated black headlining, three-spoke leather covered steering wheel, leather gear knob, 50/50 split folding rear seats, boot light, instrument brightness control. 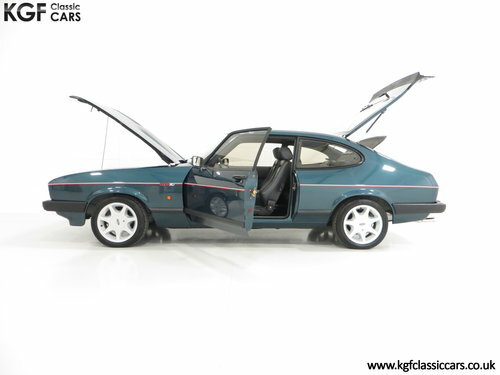 An instant classic the moment it rolled off the production line, this limited-edition Capri 280 is finished in the only exclusive colour available, Brooklands Green Metallic, (Code T7), and has a superb finish. All exterior trim items and decals are pristine other than two touched in marks to the coachline and a tiny mark to the scuttle panel. The body has never been machine polished and retains its desirable factory standard appearance craved by purists and exactly as Ford intended. The underside is remarkable and is a perfect reflection of the low mileage, warm storage conditions and limited fair weather use. Simply breathtaking. The interior is distinguished by seats fully trimmed with luxurious, high quality Raven leather with Burgundy piping and are Recaro designs. The deep pile grey carpeting is spotless and the black perforated headlining is tight and clean along with the leather covered steering wheel and gear knob, all commensurate with the incredibly low miles covered. There are absolutely no cracks to the dash and the dials, switches and controls are brilliantly clear. Carpet mats have been fitted and minor veins to the driver seat are barely visible. All controls and gauges fully function including the two-speed heater fan, analogue quartz clock and electronic cassette player. The rear parcel-shelf is incredible and the boot area remains unused. 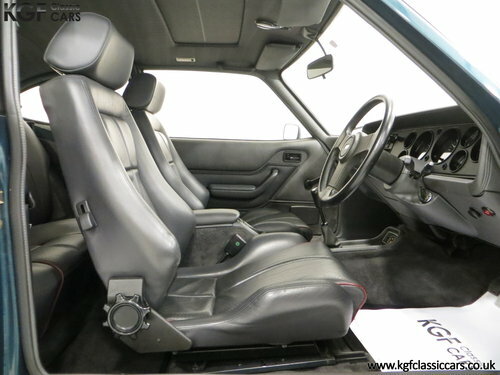 This is a very exclusive and iconic 80’s interior exactly true to the manufacturers intentions. 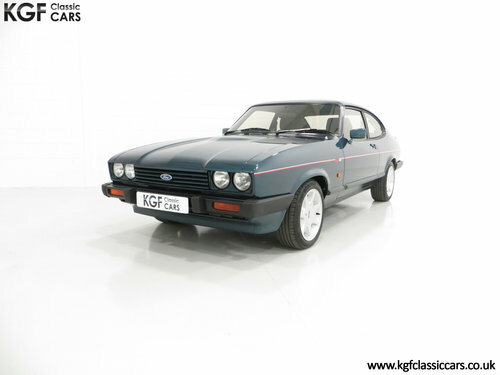 The Capri 2.8i was entrusted to Fords Special Vehicle Engineering group, (SVE), who added a Bosch K-Jetronic fuel injection system, an oil/water heat exchanger, viscous coupled fan and an improved radiator making this models 158 BHP capable of 130mph and 0-60mph in 7.9 seconds. The engine is smooth and quiet whilst producing an unmistakable burble. Correct factory under bonnet identification plates are intact including the metal plate with the ‘Brooklands’ inscription and exhibitionists will wow spectators with the cleanliness and originality under the bonnet. The 5 speed gearbox is light and progression through the range is precise. 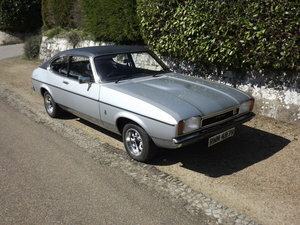 This 280 Capri is fitted with the factory correct and unique 7-spoke 7X15 inch alloy wheels and have never been refurbished. Premium matching Continental 195/50 ZR15 tyres are fitted and are as new. The spare is still the original Pirelli Cinturato P7 tyre. The hydraulic dual-line servo-assisted brakes with ventilated front discs unique on the 2.8i stop the car quickly and in a straight line. 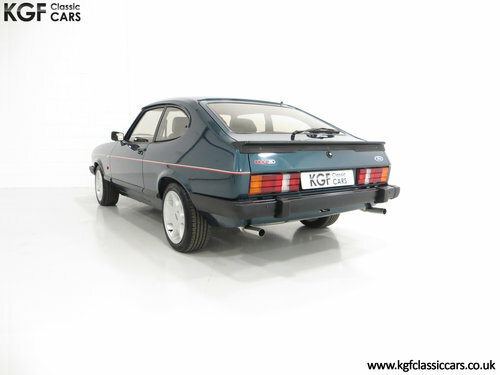 Coveted by collectors the limited edition Capri 280 is the most difficult ‘car you promised yourself’ as only 1038 were produced to celebrate the last of a famous line. GG11829 is build number 971 and has only had two former keepers from new. 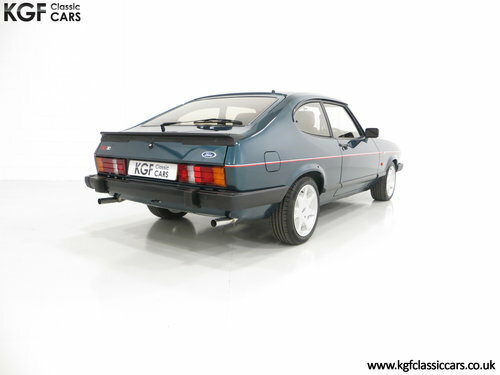 The first owner was Ford themselves who registered the car on the 1st August 1987 followed by Mr Powell who purchased it when just six months old. The Used Vehicle Invoice reveals the sum paid of £9,960.50 when the car had covered 3,070 miles. Mr Powell also stipulated at this time that the oil be changed to Shell Gemini Motor Oil, a premium oil and his only choice. He lovingly garaged the vehicle for most of its life (hence the low mileage of 6,212) and kept the car in pristine condition – which is how it still presents today. In 2013 when Chris Powell sadly passed away, the car was sold to best friend and third registered keeper, Mr Gilette who recognised the significance of this 280 and also kept the car in a preserved state. 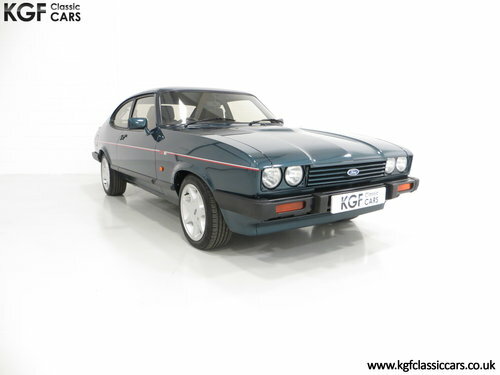 The car's condition today is stunning and KGF Classic have embarked on a full recommissioning programme using only genuine Ford service items ready for the next owner to enjoy and cherish. MOT October 2019 and HPI Clear. 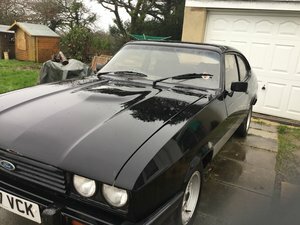 1972 FORD CAPRI PERANA - 5.0 V-8 - ULTRA RARE CAR !!! 1974 Capri Stampede - Jeff Uren car. 22,000 miles RARE!